Today I’m writing about a book I’m not done reading yet, because I already know I can recommend it—especially to any Nebraskan who wants to know more than they (might have?) learned in school about Malcolm X.
Manning Marable worked for years on “Malcolm X: A Life of Reinvention,” and it’s a book that combines extensive research with skillful storytelling and readability. Marable died shortly before the book was published in 2011. The book went on to win the Pulitzer Prize, and gathered both wide acclaim and bitter detraction. It was a labor of love for Manning Marable, who was Director of Columbia University’s Institute for Research in African-American Studies (IRAAS), which is responsible for the The Malcolm X Project at Columbia University. 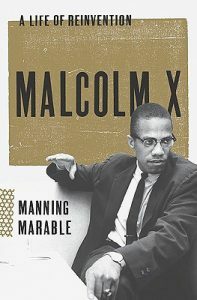 Marable takes a more academic, yet still very readable, approach to the life of Malcolm X than the book you might already be familiar with, The Autobiography of Malcolm X, which was a collaboration between X and Alex Haley. If you’re not already familiar with that book, which came out in 1965 shortly after the death of Malcolm X, we have copies in our book club kit collection here, and it’s also recommended. It made the Nebraska 150 Books list. Marable’s detractors fault him for being perhaps too eager to present details that the autobiography may have glossed over, enhanced, or simply left out. Each book has a different goal, to be sure, and to my mind it seems that the persona that is set forth in the autobiography was one that Marable accepted, and that he knew to be secure and strong in the minds of readers—and so his unexpected explorations are really a testament to his faith in the significance and consequence of Malcolm X as an individual. When you’ve centered so much of your professional life around someone’s legacy, as Marable did, especially when that someone is as complex as Malcolm X, appreciating and acknowledging that complexity is what separates dedication from devotion, or veneration from worship. Of particular interest to Nebraskans, Marable’s book gives more context to the Omaha life of the family of Malcolm X than Nebraskans might know, and you’ll read disturbing details of KKK activity in Lincoln and Omaha in the early 1900s. This is a part of Nebraska history you also might not have learned about in school. To put that in some context, we’re coming up on the 100-year anniversary of the Omaha race riot of 1919, where a mob of white people stormed the Douglas County Courthouse and lynched a black man, Will Brown, awaiting trial for a crime he most likely did not commit. The mob also fatally wounded the Omaha mayor, Edward Smith. For more background on the event, see this recent addition to Nebraska Memories, and also this pdf from the Nebraska State Historical Society. Marable, Manning. Malcolm X: A Life of Reinvention. New York: Viking, 2011. Print. This entry was posted in Books & Reading, General, Nebraska Memories and tagged #FridayReads, Friday Reads, Malcolm X. Bookmark the permalink. I read “The Autobiography of Malcom X” back in the ‘60s, and was deeply moved. Good to see that it’s not forgotten (it was part of a class assignment at Northwestern University). Your mention of it got my attention, and that led my eye to your mention of the Omaha race riot. My aunt told me that my Grandpa Strimple (a strong liberal at a time when that was an unusual stance) was ready to go down to the courthouse when Grandma caught him by the coattail. “You’ve got three little children to take care of here, Everett—don’t you dare leave this house!” Grandpa died when I was nine. How I wish I could have talked to him when I grew up. I wonder if he was sorry that he stayed home that day. My guess would be “Yes.” He was a great believer in racial equality. I think of him often.